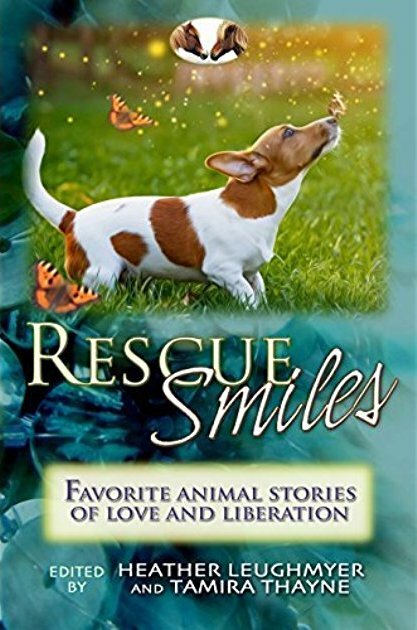 Rescue Smiles: Favorite Animal Stories of Love and Liberation is a 2017 Dog Writers Association of America Maxwell Medallion winner in the category of Book – Human Animal Bond. Find the list of all the 2017 DWAA Writing Competition winners here. Heather Leughmyer is the author of Adopting Adele, A Rat’s Guide to Owning a Human, and If Your Tears Were Human, and co-editor of Rescue Smiles. She is also the founder of Happy Endings Rat Rescue, and a graduate of Indiana-Purdue University with a B.A. in Writing and Linguistics. Tamira Thayne is the author of The Wrath of Dog, The King’s Tether, Foster Doggie Insanity, and Capitol in Chains, and the co-editor of Rescue Smiles and Unchain My Heart. Tamira pioneered the anti-tethering movement in America, forming and leadingthe nonprofit Dogs Deserve Better for 13 years. During her time on thefront lines of animal activism and rescue she took on plenty of bad guys (often failing miserably); her swan song culminated in the purchase and transformation of Michael Vick’s dogfighting compound to a chained-dogrescue and rehabilitation center. Tamira’s spent 878 hourschained to a doghouse on behalf of the voiceless in front of statecapitol buildings nationwide, and worked with her daughter to take on aschool system’s cat dissection program, garnering over 100,000signatures against the practice.